It’s official…opening day for halibut fishing is March 1st, and that means it’s “Game On” for Port Renfrew’s fishing once again. This time of year can yield the big slabs from the wild west coast of Vancouver Island…fewer fish caught, and usually at anchor, but they are bigger than average and sometimes monsters from the deep! We look forward to the first reports of halibut catches, hopefully starting this Sunday. We can almost taste those fish and chips now…time to stock up on tartar sauce. Effective March 1, 2009, recreational fishing for halibut will be opened coastwide. The daily limit at the start of the season is one (1) per day with a possession limit of two (2). possession limit of two (2). this licence in management Areas 121, 23 and 123." The fishing season is not quite here for Port Renfrew, but we’re getting close. Halibut season should be open soon (announcement expected by the end of February). In March, we will begin see the first of the “Columbian” salmon — early Fraser River springs that provide early season adrenaline. These scrappy fish are commonly 20-30 pounds and are fatter rather than longer — aka “footballs”. And from that point…it’s game on! Good times are on the way. In the meantime, we have to find our fun where we can. If you have access to a Nintendo Wii, go rent the “Rapala Tournament Fishing” game. The kids complain that it’s boring, because you can’t steal cars, beat people up, or see blood splatter from machine gun fire. But if you’re into fishing, it is pretty fun! You choose a boat type, angler, location, and gear, and motor to the spot you like. There’s a few locations for salmon, coho (silvers) in Alaska’s Kenai River or chinook (Kings) in the Sacremento River in California. The casting with the Wii nunchuk feels pretty realistic. 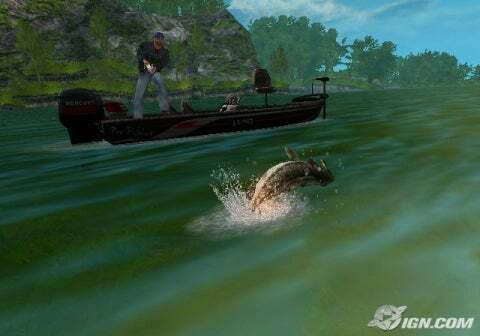 You can view the lure underwater or you can view the water surface from the boat. Your fishing buddy sits at the steering wheel giving “helpful” advice as you fish…just like real life. When a fish hits, you have to set the hook quickly or it will get away. Then you reel it in. If you reel too fast or have the drag too tight, you’ll break the line; if you don’t reel fast enough or have the drag too loose, it will shake the hook. When the fish takes line, the nunchuk vibrates in your hand…gives a little hint of those summer screaming reels! Of all the locations, I recommend chasing the Tigerfish in Lake Victoria, Africa, as the most fun….the 100 pound plus fish required the strongest line on offer, or they would snap it every time. The fish go on long runs, with the line ripping off the reel, you felt like you were really there (we ran the batteries dry!). Here’s a youtube video of someone catching an 11 pound King (Chinook) salmon. The game’s not perfect, there’s some annoying things from a serious angler’s point-of-view, but it’s got enough fun parts that I’d highly recommend it. See you out on the water soon, in the meantime, see you at the video game rental store. You are currently browsing the Port Renfrew Fishing Report blog archives for February, 2009.